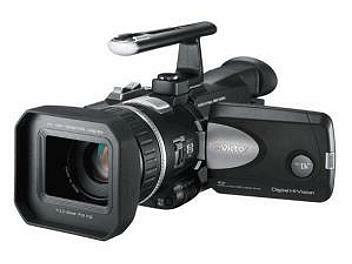 The world's first low-cost HD camcorder. New developed Lens for HD video image x 10, F1.8. Optical image stabilizer system: with on/off switch. New 1/3-inch 1.18 Mega-pixel progressive scan CCD (Single chip). 16:9 still image capture, MPEG-4 clip capture with SD memory card. Real time video streaming possible via USB interface to PC. Pro pad (XLR x2, Microphone holder). Audio level indicator on LCD monitor,Color Bar. New PC software for MPEG2TS Editing.